Sui-ren started in 1996. 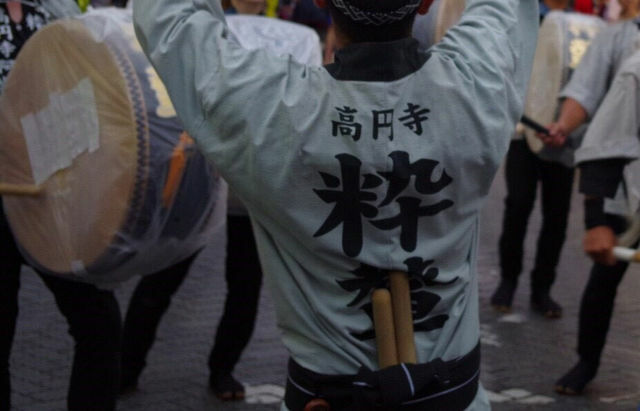 It is one of the official Ren (‘team’) in Suginami Ward, Tokyo. 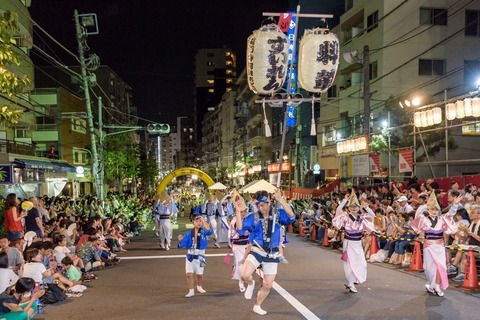 The Ren joins the Koenji Awa-Odori (odori means ‘dance’) Festival every year. 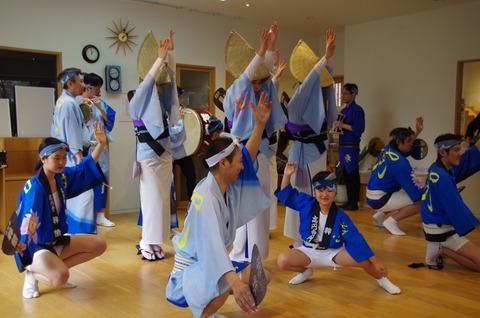 The Awa-Odori music is usually characterized with a catchy bouncing rhythm, while Sui-ren mainly uses a flat sound. A big drum creates a dynamic sound under this rhythm. Sui-ren's sound is interestingly dubbed as Japanese Rock ’n’ Roll because of their exciting sound and performance. 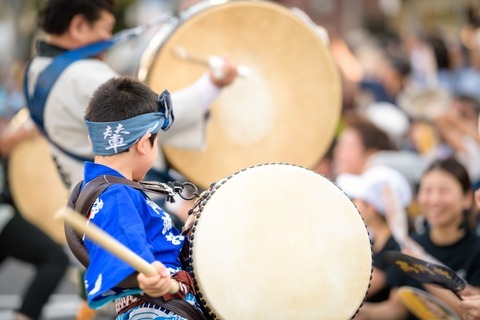 Many people come every year to see Sui-ren at the Koenji Festival. 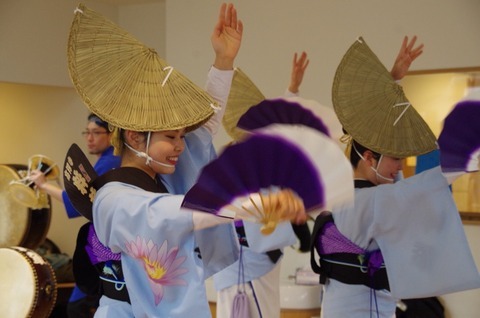 A fan performance by the women’s group is also visually unique and elegant in nature. 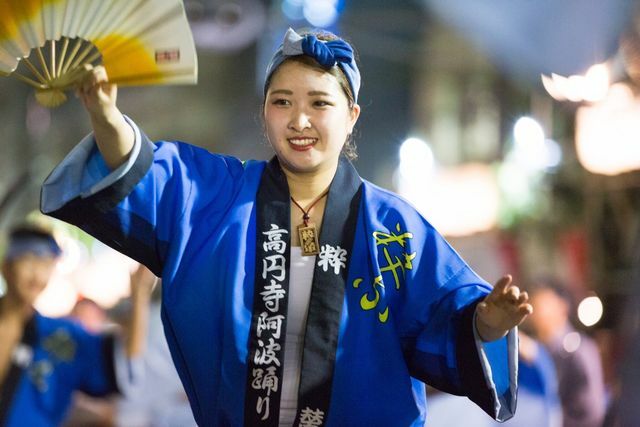 A dancer, in her traditional kimono, uses a folding fan quite gracefully as she sways and glides throughout the performance. When the performance starts, she puts it under her obi-belt. In the middle part, she takes it out from the belt and opens it, making a nice surprise for the audience. 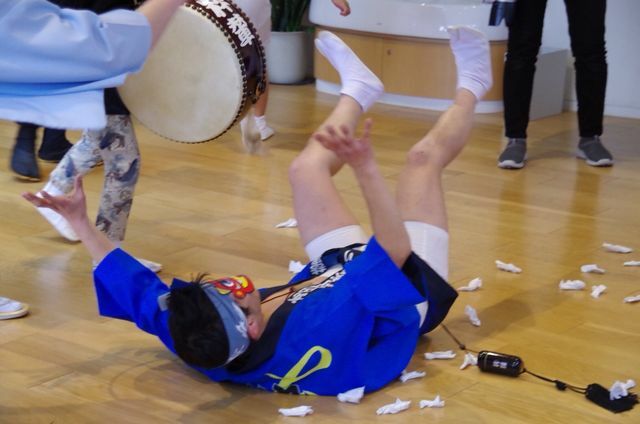 If you come to see Sui-ren, you should look forward to watching this fantastic fan performance! Sui-ren’s main color is blue. 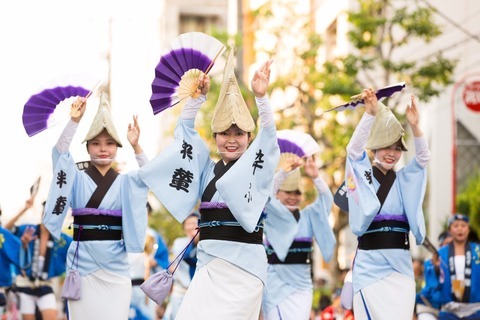 Women wear pale blue kimono. On one sleeve, you can see one Chinese character which means "cool" because Sui-ren’s “Sui” means “cool”. Men wear blue “Happi” and white short pants. “Happi” is a short kimono. 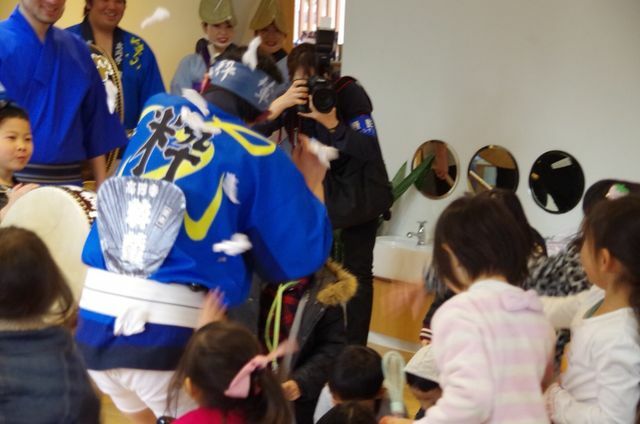 They put a blue and gray Japanese towel (Tenugui) on their head. The women dancers of the “Men’s Dance” wear the same costume. Big drum players wear grey “Happi” and black pants. 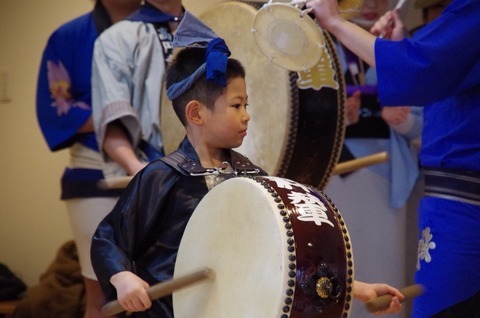 All musicians except these players use kimono. 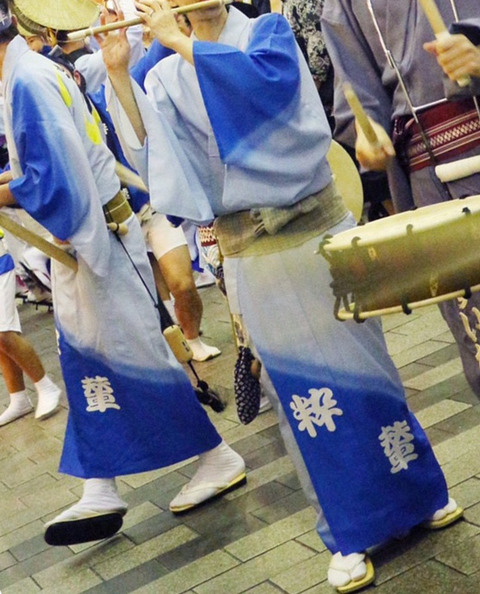 Both male and female musicians put the kimono in the same way. 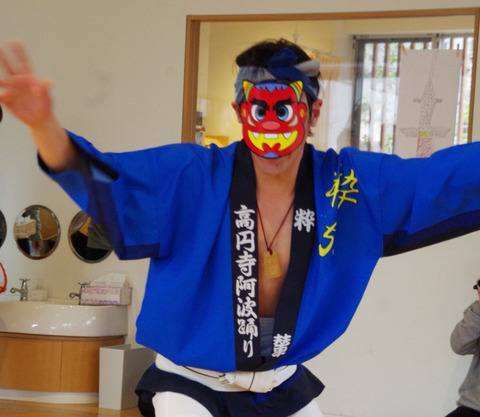 Usually in Japan, male and female wear kimono in different ways. The women usually place the obi on their waistline, which is wider than the men’s obi. 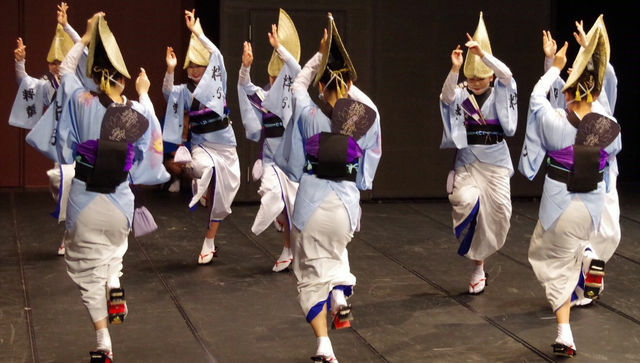 On the otherhand the men wear the obi around their hip. It has a width of about 8 to 10 centimetres.